The narrator has obviously been listening to this story and seems to have some doubts about it because he remembers hearing another similar tale when he was much younger and in that case the thing hidden beneath the blankets was not rats at all, but something much worse. The story he shares took place on the Suffolk coast, where his acquaintance, Mr Thompson—then only a young man himself—had taken a room at a quiet inn, where he hoped to be able to enjoy the solitude and devote some time to reading. Thompson did not spend all of his time reading; however, he also enjoyed some long walks in the countryside. One day he forsook the open country and took a walk down the passage instead. When he found the door of the ‘south-west room’ locked Thompson’s curiosity got the better of him and what he found inside the room made him forever cautious of doors and what he might find behind them. The title of this story is a little misleading perhaps, but “Rats” is a rather enjoyable story. It is a classic ghost story, written by a master storyteller. 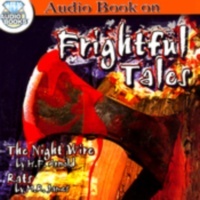 The Frightful Tales audiobook version has a runtime of about seventeen minutes. James Mio reads the story very well, but the recording—although clear enough—has a hollow sound that gives the impression of having been recorded inside a box. Much more annoying, however, is the hissing and whistling quality to a lot of the words. If you have ever heard anyone trying to speak when they have just lost a tooth, then concentrate on that memory right now and you will have some idea of what to expect if you decide to buy the audiobook.